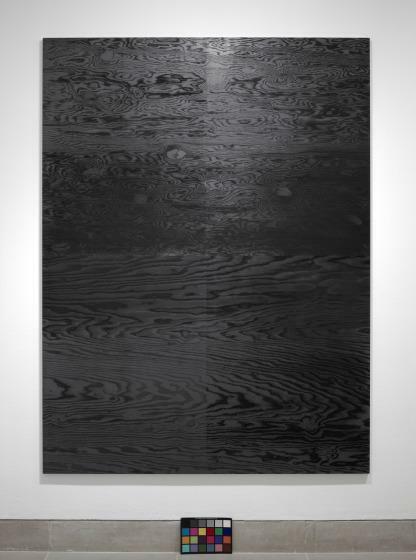 Untitled, which hangs on the wall as a painting, appears to be a charcoal-black four-part panel of plywood, its wood grain meticulously detailed in the surface. As in other bodies of work, McEwen illuminates assumptions of reality, both connecting his work with rich artistic tradi­tions such as tromp l’oeil painting, post-painterly abstrac­tion, and Minimalism, and subtly questioning definitions of painting and sculpture as cohesive or independent prac­tices. McEwen’s interest in nomenclature and the power of signification extends into his uses of material. Graphite is just another form of carbon, as is the diamond. Possessing identical chemical elements, graphite and diamond differ only in their crystalline structure, a differentiation both slight and profound in determining their material value. In this way, McEwen’s work poignantly draws attention to our culture’s increasingly passive consumption of information. 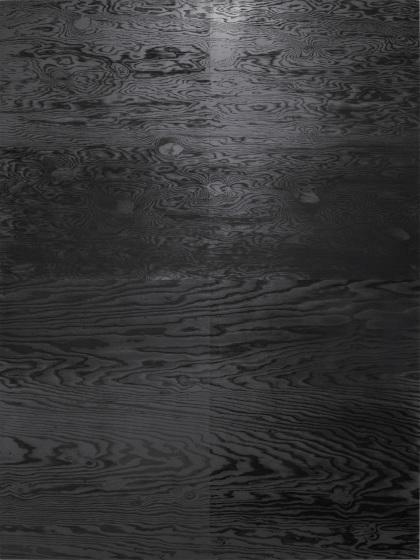 Anna Katherine Brodbeck, ed., TWO X TWO X TWENTY: Two Decades Supporting Contemporary Art at the Dallas Museum of Art (Dallas: Dallas Museum of Art), 2018.